On arrival in Canada in 1862, he was employed as Adjutant Royal Artillery at Kinston, a position he held for four years. He was described as, “a fine officer, but on occasion his sound military knowledge and attributes were prone to clash with political and civil phases of Canadian life”. With the departure of the Royal Artillery from Canada in 1871, he was appointed Inspector of Artillery and Warlike Stores (a position he shared with his counterpart in Quebec), as well as Commandant of the School of Gunnery, Kingston and Officer Commanding “A” Battery. His administrative competence, vast experience and attention to detail were soon evident; “A” Battery achieved a remarkable proficiency within one year. 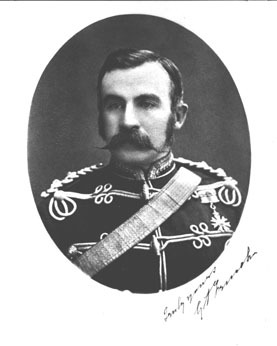 On 8 July, Commissioner French led his column west from Dufferin beginning the Force’s Great March. The men and animals suffered in the heat, wet and cold. Often deprived of food and shelter, they stoically followed Commissioner French ever westward. The trek from Fargo to Dufferin, to the Belly River, Milk River, Fort Pelly and return through Winnipeg to Dufferin was accomplished in 102 days, covering an average of 19-1/5 miles a day! The aim had been accomplished; a string of North West Mounted Police outposts now crossed the Canadian west. Much to the credit of French and his constables, a friendly and trusting relationship had been established with the prairie tribes. 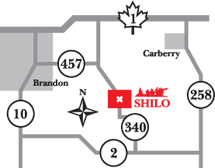 The force had established itself as the law in the Canadian west.